The simplest way (but more costly, about NT$1,000 or US$35, however should be less than US$50) to get to Academia Sinica by yourself from Taoyuan International Airport is by Taxi. 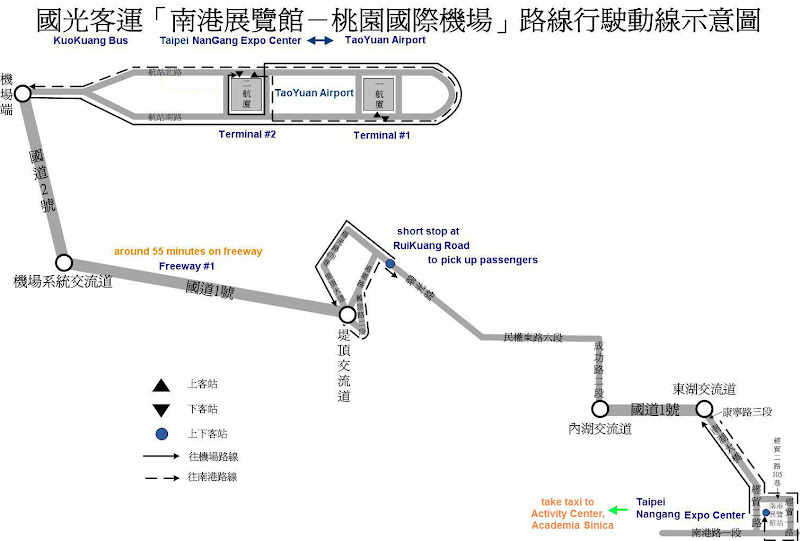 A more economical way is to first take one of the buses to Tapei City center, then take a Taxi from there to the Activity Center, Academia Sinica. first take Bus Kuokuang Line (1843) from Airport to Taipei Nangang Exhibition Center, fare is NT$115 or US$4, driving distance is 80 minutes. then take Taxi from Nangang Exhibition Center to Activity Center of Academia Sinica, fare is about NT$100 or US$3, driving distance is 6 minutes. For convenience, all foreign participants are encouraged to stay at the Activity Center, Academia Sinica. The price for single room is TWD$1250, double room is TWD 1550. This price is for PyCon Taiwan registrations only. Request for one more extra bed charge TWD 450. Request for one more person charge TWD 300. Check-in time is after 14:00 and check-out time is before 12:00 noon; delayed check-out will be fined TWD$100 for each hour. They accept New Taiwan dollars only but US dollar exchange is available, you can refer the exchange rate by the site. To get the above discounted price, you need to contact PyCon Taiwan. Alternative hotels are listed below with price and you will need to take care of the transportation. PyCon Taiwan will not help you book the above hotels.